What is Pebble Health? And why should Apple and Google be worried? Although they're not dedicated fitness tracking platforms, both the Apple Watch and Android Wear allow users to track their general activity (how far they walk, the number of steps taken and hours slept). So far, this feature has been missing in Pebble's range of smartwatches. That's not to say they're not capable of fitness tracking - the devices do include accelerometers (the hardware used for sensing movement) - but it was up to software developers to utilise the hardware. Some developers, such as Jawbone and Misfit, did so, but the apps drained battery and didn't come preinstalled. Enter Pebble Health, a native activity and sleep tracking experience, which is integrated throughout the OS. Pebble Health was developed in collaboration with researchers at Stanford University. It tracks your daily activity and automatically detects when you're asleep. The tracking is integrated with the UI, making daily stats and insights instantly available in the Timeline. For example, you can wake up to your day with a report on how well you slept, and end the day by viewing how many steps you've taken. Instead of striving for the magic (and slightly pointless) 10,000 steps a day, Pebble Health will measure your performance against your own average. As well as simply tracking, Pebble will also provide suggestions on how you can improve fitness and sleep. As well as native tracking, Pebble will also grant its eager developer community access the APIs. This will give developers the ability to build their own apps and watch faces capable of harnessing the data. As we previously mentioned, Pebble Health was developed in collaboration with Stanford University, or more specifically, its Wearable Health Lab. This was in an effort to create a truly accessible health platform available. "Transparency at the algorithmic level is an essential missing piece in the progress toward making wearables valid for use in health applications," said Dr. Christy Lane. "By making the right data available, Pebble Health allows us to perform proper validation studies on activity tracking for the first time." "Now, methods for collection of wearable health data will be transparent, allowing health professionals to apply previous insights to new data. We're excited to collaborate with Pebble on this approach and further our mission to lead the way for wearable health and medicine applications." A welcome addition to Pebble Health is the ability to also sync data with Apple Health and Google Fit, giving users a more granular view of their health. Naturally, questions will arise over whether the Pebble Time is an accurate enough tool for collecting reliable health data. The basic smartwatch doesn't include a heart rate sensor or GPS, so it's less accurate than, say, the Apple Watch, most Android Wear devices, and even the Fitbit Charge HR. Despite that, the concept of an open source health data platform is incredibly powerful, regardless of privacy fears, so perhaps Apple and Google should be worried. 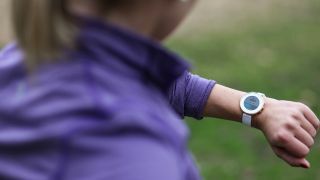 Pebble Health will make an appearance on the Pebble Time, Pebble Time Steel, and Pebble Time Round, so original Pebble wearers will be left lazy and tracker-less. You can update your smartphone app to receive the firmware upgrade. We'll be updating our Pebble Time review as soon as we test Health's accuracy.